4B Farms is located in NW Kansas near a small farming community. 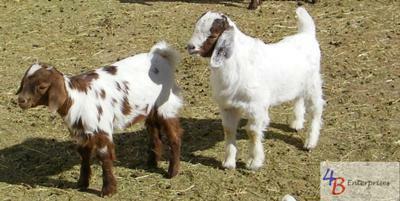 We raise our goats on natural feed and forage, we do not use unnecessary antibiotics or growth hormones. Our goal is to provide quality meat products to our customers at a reasonable price. We can provide custom cuts, whole carcasses and even live goats upon request. Please give us a call at 785-824-3217 or visit our website at www.4b-farms.com for more information. We bought 4H kids from them in 2009, 2010, & 2011. Champions every year! !